The ringing of bells is one of the most significant rituals performed during the puja among the Hindu community. It is believed that the ringing of bells produces the sound Om which was the first sound to emerge in the universe. It would therefore ward off all negative influences out of the minds of the devotees and help them focus on the worship. While doing the puja at home or at a temple, people ring the bell as it is known to produce positive vibrations and keep the mind focussed. During aarati , the bell is accompanied by other instruments to create a rhythmic sound that is entertaining as well as serves the purpose of enhancing the concentration. The whole world is made of energy and sound vibrations have an impact on the listener. Some sounds are known to irritate the mind and some are known to calm the mind. Our ancestors understood the concept of this principle very well and induced the ringing of bells as a ritual during puja. 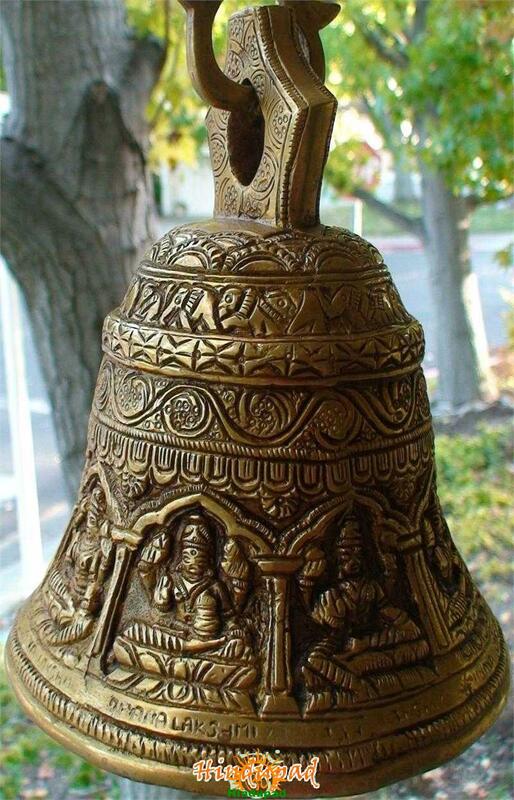 When we ring the bell, the sound vibrations it produces calms the mind of the devotees. Meaning : I ring this bell indicating the invocation of divinity, so that virtuous and noble forces enter my mind and the demonic and evil forces depart from within. Buy Decorative Meena Work Pooja Bell online at lowest price from Divyamantra.com. Easy Return – COD-Only Genuine Products – 7 Day Replacement Guarantee.